If your course involves at least one supervised exam, you may be required to register at the examination site. Identify your situation in the table below and, if required, register before the deadline indicated in the form. 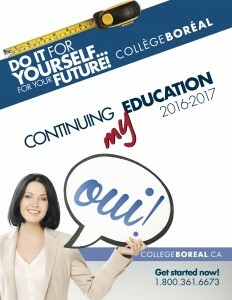 It is possible to write your exam under the supervision of a proctor if your location is more than 100 km from a Collège Boréal campus or access centre. You must first register with the examination site. This must be done at the beginning of the session. To register, you must complete the examination site’s online registration form. You must then find a person who accepts to supervise your exam at the date and time specified by the Distance Education officer. It is strongly recommended that you begin your search for a proctor at the start of the session, as it may be very difficult to find one in some circumstances. Moreover, some examination supervisors (especially those who are members of an institution that offers an examination supervision service) may charge a fee. Such fees are entirely at your expense. any person residing at the same address as you. Lastly, you must complete the proctor form (all fields are mandatory) and email it to the officer at your campus or access centre at least 3 weeks before the examination date. The officer will verify the eligibility of your proctor. If your proctor is accepted, you will receive confirmation and the officer will contact your proctor to provide the instructions and explain the conditions for your examination supervision. If your proctor is not accepted, the officer will inform you and invite you to submit the name of another person as soon as possible. To ensure the integrity of the examination supervision process, the Department of Distance Education reserves the right to reject a proctor. If, despite your efforts, you cannot find a person who meets the above criteria, you must contact a Distance Education officer as soon as possible to obtain advice on how to conduct your search. A person who does not meet the above criteria may nonetheless be admitted as proctor if the Department of Distance Education considers that there are exceptional circumstances and has every reason to believe that no conflict of interest exists between the student and the proctor and that the proctor will comply with the examination supervision procedure and conditions. We remind you once again that it is strongly recommended that you begin your search for a proctor at the start of the session, as it may be very difficult to find a proctor in some circumstances. You must attend your exam session at the date and time specified by the campus or an access centre registered with Continuing Education. You will need to present photo identification (driver’s license, passport, health card or other valid identification).